Spring has sputtered in New Brunswick – it was nowhere to be found in March, finally appeared in late April and although May has had a few warm days, the month is still running slightly below normal in Greater Moncton. In its seasonal forecast, the Weather Network believes a cool June should give way to more consistent warm weather during July and August. A humid summer is expected which may result in warmer than normal temperatures at night – overnight lows average about 12 C.
While periods of dry weather are expected, heavy showers and thunderstorms should bring rain totals to near normal for the season. I had to make at least one more trip to Aboiteau Beach in Cap-Pele yesterday before the official end of astronomical summer. It turned out to be a beautiful day with just a few clouds, an afternoon high near 24 C and the water of the Northumberland Strait was still warm. The beach was quiet with only a handful of sunbathers and many who arrived chose to go for a stroll along the water’s edge. Much needed rain fell today but it was still warm and humid with a high near 20 C.
A warm, dry trend which began in July continued in August in Southeast New Brunswick. Although the temperature only climbed above 30 C once, there were 20 days with highs between 25 and 30 C often with high humidity and the overall monthly average was almost one degree above normal. Rainfall was actually slightly above normal although a single rain event on 17 August delivered 35.4 mm which was more than one third the monthly total. 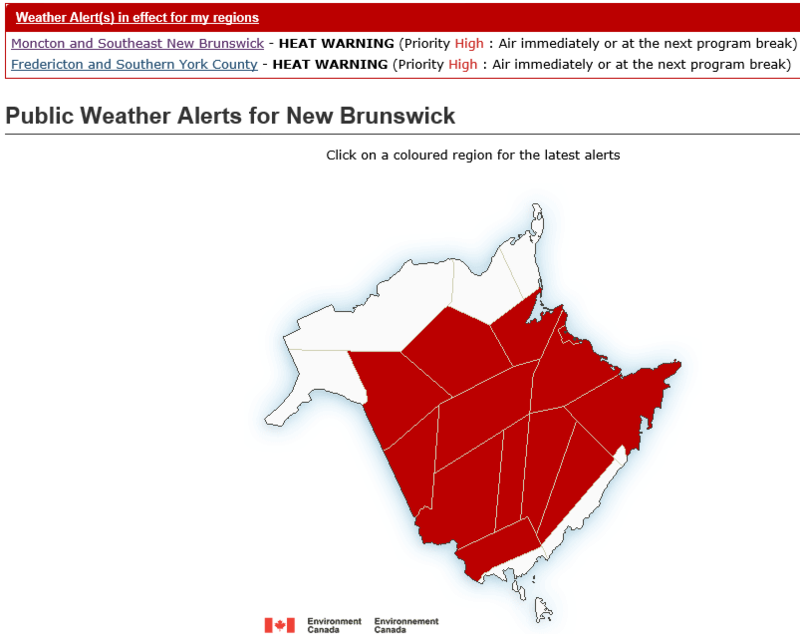 For the first time this summer, Environment Canada has issued a heat warning for Greater Moncton and Southeast New Brunswick. Humidex values between 35 and 40 degrees are being experienced inland across much of New Brunswick today. Conditions are expected to persist this afternoon and then gradually diminish this evening as temperatures drop in the low 20’s overnight. Another period of hot and humid weather is expected for Wednesday before subsiding at night. Heat warnings are issued when high temperatures or humidity are expected to pose an elevated risk of heat stroke or exhaustion.